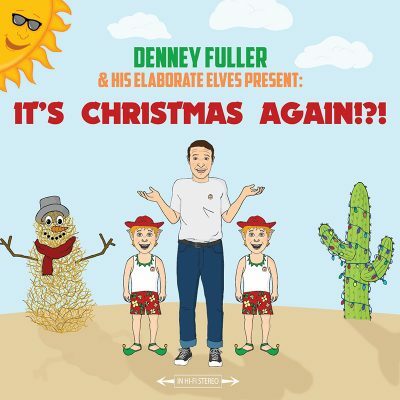 Utah’s own Denney Fuller has created a one-of-a-kind Christmas gift with his soon-to-be-released album, Denney Fuller & His Elaborate Elves Present: It’s Christmas Again!?! Fuller brings some sunshine to the joyful season with three modern arrangements of classics and four of his original songs, complete with new Christmas characters. Fuller decided to create music for his family and friends as gifts because he considers music to be a gift. “Music is special and unlike anything that humans can do to connect to each other without saying words,” he says. “I don’t want to get cheesy here, but we all love music. I don’t know anyone that doesn’t like music.” Fuller started creating these holiday gifts in an interesting time for a Christmas album: the middle of summer. “It’s kind of a trip,” says Fuller. “You walk outside and it’s 100 degrees, you’re in your tank top and shorts, and you’ve still got ‘Silent Night’ stuck in your head.” The entirety of the album took Fuller 115 hours. “I literally did everything,” he said. “I love being that multi-instrumentalist guy. I have such a respect for people that try things. We’re going to fail as multi-instrumentalists, but we’re going to keep going because you have the studio as your friend.” Some of the instruments he plays on the album include: vocals, glockenspiel, trumpet, ukulele, euphonium, guitar, bass, organ recorder, flute, sleigh bells and more. It’s Christmas Again’s four original songs are “Danny the Elf,” a music box song; “Shh, It’s Snowing,” a minimalist song; “Wake Up Johnny, It’s Christmas Again?! ?”; and “Sunshine Christmas,” the Beach Boys vibe song that you’ll hear on this podcast. There are also three modern arrangements: “I Saw 3 Ships,” “Good Kind Wenceslas” and “Silent Night,” featuring The Cathedral Quintet. “Everyone’s favorite song, ‘Silent Night’ is the one that’s very ethereal and has the bowed block,” says Fuller. He recorded all these songs at his shared studio with Joe Hernandez at the Fallout Building (600 West and 600 South). “If anyone wants anything recorded or produced, just let me know!” says Fuller. The upcoming release show for Denney Fuller & His Elaborate Elves Present: It’s Christmas Again!?! is going to be one you don’t want to miss, featuring great local talent, including band members from St. Bohème: Beaux Underwood (vocals, banjo, accordion, guitar), Parker Childs (doublebass) and Allison King (violin). There will also be many more local talent from across Salt Lake City that are joining Fuller as this “elaborate elves.” Fuller and his elves are collaborating with the Utah Asian Association to try and benefit the local Utah refugees as much a possible with a suggested $5 donation. “You can donate more if you’d like as well,” says Fuller. Don’t miss the show, Dec. 8 from 7 p.m. to 10 p.m. At the end, Fuller will lead a Sing-Along—and there might be a surprise visit from St. Nick.